Primary Schooling in Malawi is available to all and free. However, resources are limited. There are not enough teachers and classes of 100 or more are common. 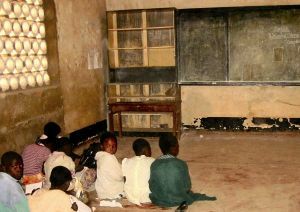 Classrooms often do not have desks and children sit on the concrete floor. Sometimes there are not even classrooms and lessons take place in the open with a blackboard against a tree. There are hardly any books or other resources. Enrolment for primary school has risen to 97% (2009). However, the lack of facilities, distances travelled to get to school and pressure on families to keep children at home to work in the house and fields mean that attendance is only 78% and more than half drop out before the end of schooling. Primary education lasts for eight years - 6 to 13 year olds. However, many pupils are older than this if they repeat years if they do not reach the required standard and may drop out for a period. Teaching is conducted in Chichewa, the main local language, and English is taught as a second language. At the end, pupils sit the Primary School Leaving Certificate examination. The most successful are selected for the limited number of secondary school places. 27% of children get to secondary schooling which lasts for 4 years (age 14-17 but with many older students). It is taught in English and has subjects similar to the English GCSE. There is no A-level stage. Secondary schooling goes up to the equivalent of AS-level and there are then four years for college or university courses, which are very limited in number. Half of the population of Malawi is under 15 years of age (UK 24%), so there is a very high number of school age children. 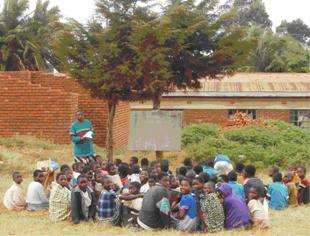 In Dedza, there are over 200 primary schools which often have over 1000 pupils. Government secondary schools can be Community Day Secondary Schools for local children or boarding schools that take children from across Malawi.